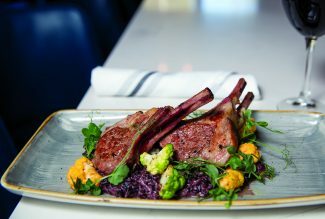 Named after the 10th Mountain Division, which trained on the nearby mountains, The 10th combines stunning alpine views with impeccable alpine flavors inspired by the mountains of Colorado and Europe. New Executive Chef Tim McCaw — most recently at the helm of Zach’s Cabin over at Beaver Creek Resort — took a research trip this past spring to the Alps, visiting Germany, Austria, Italy, France and Switzerland. 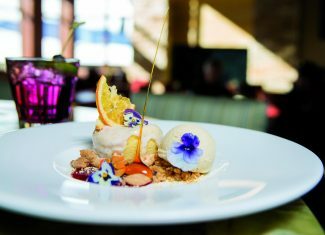 There’s no lack of inspiration for McCaw when it comes time to write the summer menu for the on-mountain restaurant, which is open for lunch served in the lounge, dining room or on one of two inviting decks. 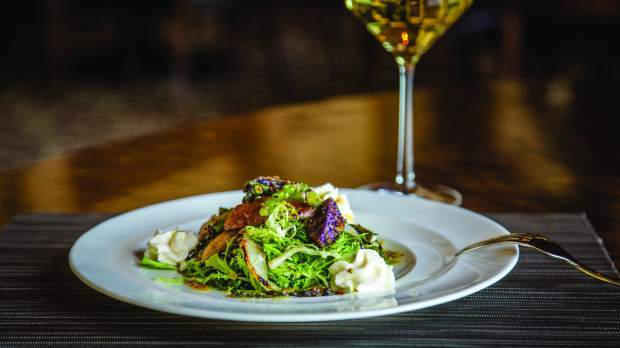 Take the Lyonnaise salad, with roasted asparagus and warm potato salad tossed in a whole-grain mustard vinaigrette and served atop a combination of both grilled and plain lettuce frisée. A light goat cheese mousse balances the flavors perfectly. “It’s light, healthy and really hits that nice flavor profile we’re looking for,” McCaw says. The burrata salad is a delightfully sweet-and-salty combination of artisan greens topped with figs, Parma ham, almonds and Champagne vinaigrette, with roasted cipollini onion jam crostini alongside. Much like the beautiful interior of The 10th, the food is clean and modern. 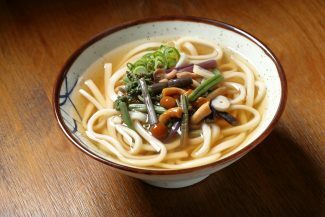 McCaw’s fun twists on traditional flavors are all over the menu. Take the funghi flatbread, topped with roasted mushrooms, truffle oil, lemon-scented arugula, truffle cheese, Parmesan and a fun addition: quail eggs. 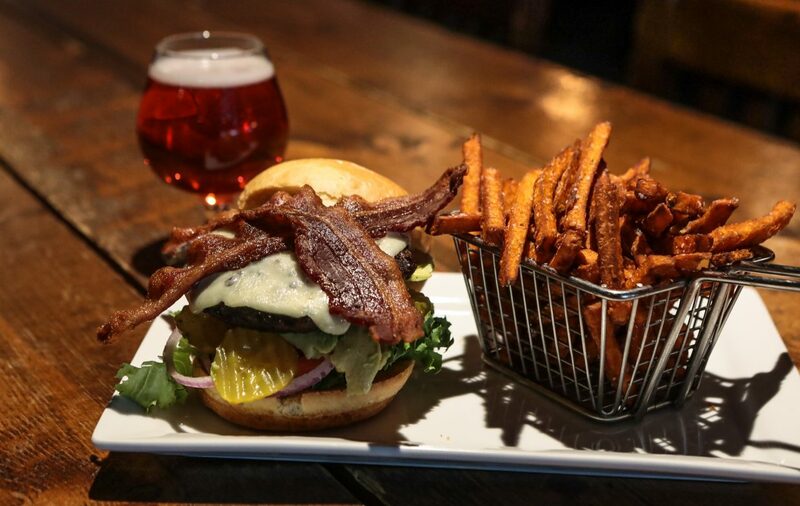 The burger, made with the oh-so-tasty Colorado beef from 7X again, is decadent, topped with Tender Belly bacon, tomato onion jam, arugula, house pickle and Muenster cheese on a house-made brioche. Many visitors work for their meal by hiking or biking up the mountain for lunch, or taking the gondola up and, after a tasty meal, hiking back down. For those not so inclined, Gondola One offers a picturesque journey. 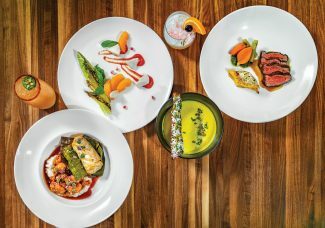 “Dining at The 10th is a great way to experience Vail Mountain, especially when some of the family doesn’t — or can’t — enjoy the activities of the mountain lifestyle. Riding up Gondola One from Vail Village, take advantage of the Lift & Lunch program, which includes a $15 credit towards lunch, savoring a wonderful meal, and indulging in the beauty of Vail Mountain can truly be “an experience of a lifetime,” says General Manager Jennifer Rizza.